That's a good one :) Btw. 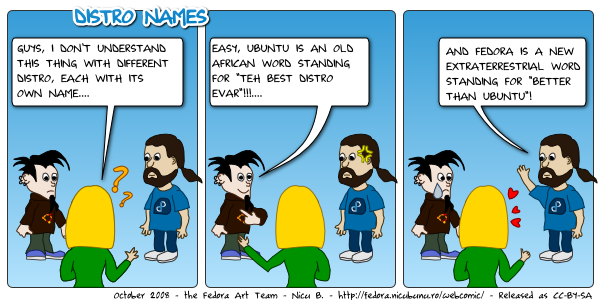 I've heard the one about Ubuntu going like: Ubuntu is an African word for "I don't know how to install Debian". I love it!!! I can't stop laughing!!! Haha, real funny man. NOT... And what's up with our obsession with Ubuntu? Are you so jealous of its popularity or what? Yes, but there is no LTS Fedora, and stop mentioning innocent animals when the LTS subject is invoked! innocent animals, like a pink pony ...with wings! Hahaha! Daca asta te ofenseaza, pregateste-te pentru ce urmeaza!